Oh boy, do I love the absolutely stunning rimfire rifles and pistols the proud owners are showcasing on Rimfire Raceguns on Facebook. The amazing thing is these guns shoot as great as they look. Are they worth the MSRP of $1,000 and even up to $2,000? Yes! Every dime. Unfortunately there are many shooters out there like me. Our funds are limited but we want to be competitive against those fabulous firearms. 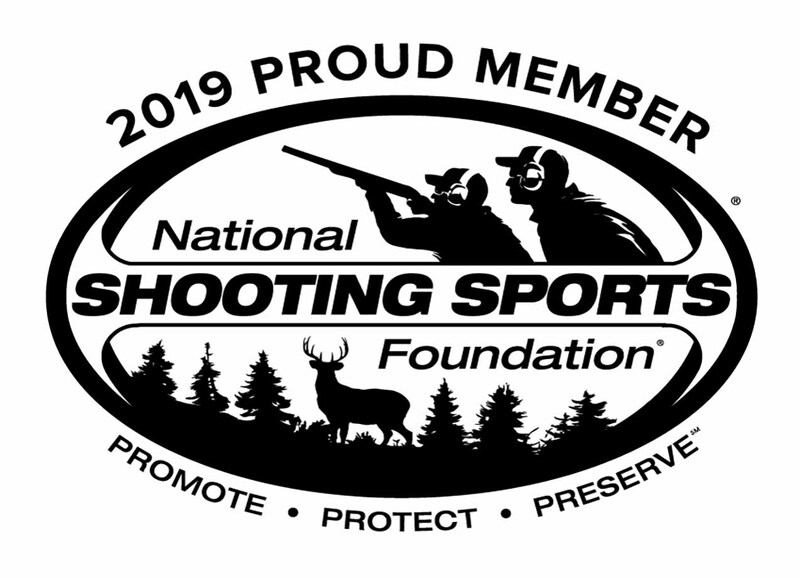 This series of articles will outline just what it takes to set up rifles and pistols on a budget. Since we are discussing competition on a budget, the "builds" are going to be guns for limited division at this time. 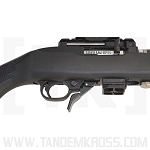 Let's start with the most popular rifle in Rimfire Challenge, the Ruger® 10/22. In this case, as with all the firearms we are going to feature, we are going to assume you already have the base firearm. First off we need a rifle with a good trigger pull. When trying to go fast, which is what this game is about, a heavy, creepy, gritty trigger pull is an anchor to speed. 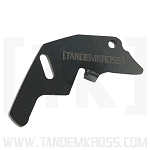 We need to get the factory 6+- pound trigger down to a weight we can manage. For the experienced shooter, lighter is better as long as it is safe and functions 100% of the time. How light is necessary? 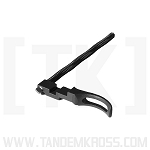 I believe that a 2.5 pound crisp trigger will never loose a match. One can go lighter but it will cost more. Since we are talking about keeping the cost down, there is really only one place to go. 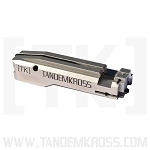 Take your trigger group out and send it to Brimstone Gunsmithing out of Camas, Washington. 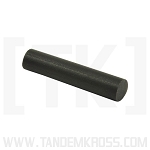 For $38.50 Brimstone will give you that "sweet spot" tier 3, 2.5 pound crisp safe trigger pull. You can spend more for their tier 2 or tier 1 trigger jobs which are $78.50 and $110.00 respectively. But we are on a budget here. 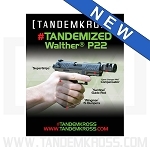 Next we need a good sight picture and for those of us with old eyes, this means an enhanced front sight (fiber optic). 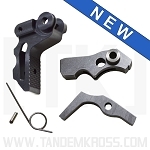 Marble makes a replacement front sight which is available from Brownells. Part number 579 604 526 (green) or 579 604 525 (orange). Cost is $16.00. One can simply drive out the old sight and tap in the new one. 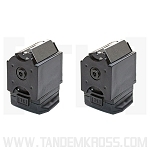 The complement to that front sight is a rear sight that allows a rapid sight picture. That, ladies and gentlemen, is the cheapest "fix." 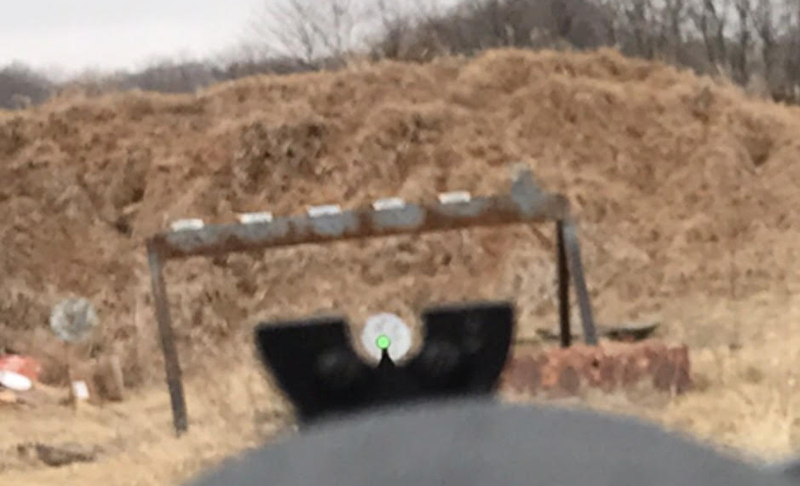 In the early years of what was then called the Ruger® Rimfire competition program, I discovered that if I simply remove the little elevation adjustment tab from the rear sightof the standard 10/22 carbine, it makes a very effective half ghost ring rear sight. Just don't forget to put the little screws back into the rear sight. This is the set-up I used to win the limited title at the 2013 World Rimfire Challenge championship. It is still effective today. The next modification I feel is mandatory is the rifle must have an upgraded 10/22 extractor. Factory extractors are mass produced through a stamping process. That process is inherently imprecise. 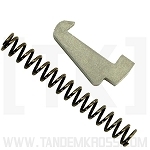 Quality aftermarket extractors such as the TANDEMKROSS Eagle's Talon 10/22 extractor are precisely made and the extractor hooks are extremely sharp. 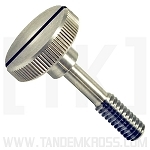 This sharpness helps keep the extracting empty case secure on the breech face till it hits the ejector. 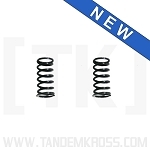 Good news: they only cost $9.99 from TANDEMKROSS. Finally on our budget build, I highly recommend some form of bump pad on the bottom of the magazine. Is it necessary? No, but here is my reasoning. 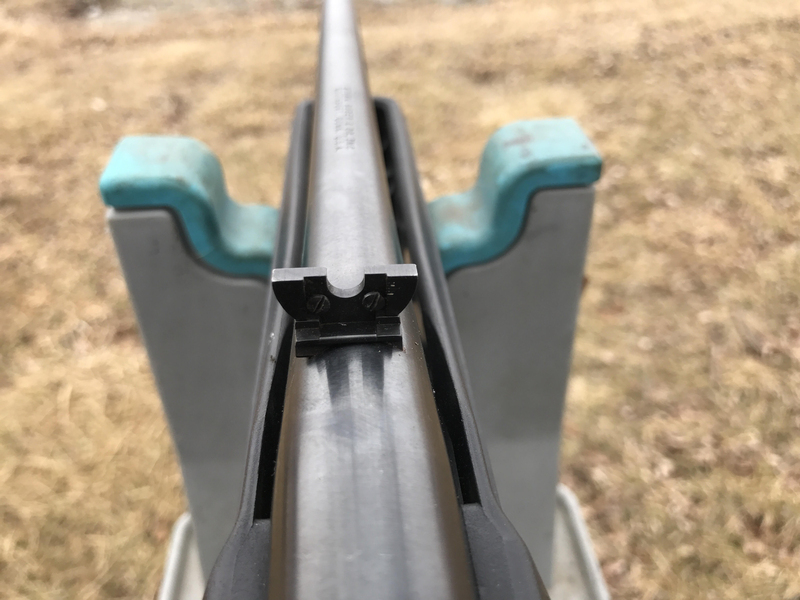 When you seat the magazine in a 10/22, many times it is difficult to confirm the magazine is fully seated. 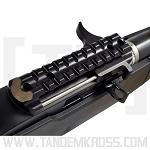 If the magazine has an extension or bump pad, such as the TANDEMKROSS "Companion" 10/22 magazine bumper or better yet, the TANDEMKROSS "Double Kross" rotary magazine body, the shooter can give the magazine a little shake or tug to assure it is fully seated. Firing one shot and having the magazine drop out because it wasn't fully seated is not conducive to fast runs. Plus, it is a little embarrassing. 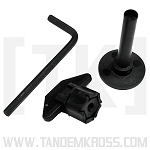 The [ T K ] "Companion" base pads are $21.99 per pair and the "Double Kross" mag bodies are only $9.99 each (and make one, 20-round magazine body out of two of your factory 10-round rotary magazines). The total cost of all the upgrades suggested above is under $110.00 and gives you competitive equipment that can be upgraded further down the road as needs and finances allow. 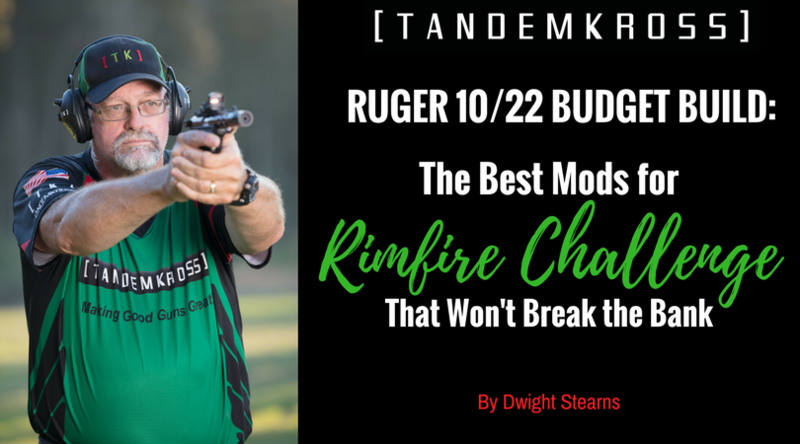 In the next article in this budget-friendly Rimfire Challenge series, I will address budget-minded modifications for the Browning Buck Mark, another popular rimfire pistol for speed shooting sports. In the meantime, stay safe and good shooting.